Gary Hennerberg is a fractional CMO and independent marketing consultant, a full-stack marketer with experience in analysis, planning, product launches, sales funnels, testing, SEO, SEM, online ads, wireframing a website, email, content development, video, building databases, and who is a student of behavioral psychology to enable effective sales copywriting for every channel. Gary Hennerberg is a fractional CMO and independent marketing consultant with a proven record of success and turnarounds. He is a full-stack marketer with experience in analysis, planning, product launches, sales funnels, testing, SEO, SEM, online ads, wireframing websites, email marketing, content development, video, and building databases. As a successful copywriter, he is a student of behavioral psychology and applies it to the copy he writes for every channel. Hennerberg is persistent and likeable. He integrates multiple marketing channels as a project manager leader for a broad spectrum of B2C, B2B, and non-profit clients from coast-to-coast, Canada, and the UK. Click here to get started. Watch this short video with more about Gary Hennerberg. My book, Crack the Customer Mind Code: Seven Pathways from Head to Heart to Yes!, is immediately available as a Kindle download. Hennerberg is a fractional CMO and independent marketing consultant, who understands strategy, creative, and numbers crunching for direct mail advertising and print, all the way through digital marketing, email marketing, video, pay-per-click, social media marketing and more. Watch videos of marketing examples where you’ll see the behind-the-scenes description of marketing turnarounds. You’ll learn Hennerberg's process for analysis, strategy, unique selling proposition development, and how he uses data to turnaround marketing campaigns. Staying relevant requires reinventing your skills and marketing approaches. 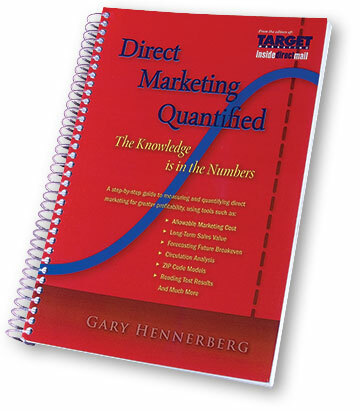 As Hennerberg has evolved and reinvented his traditional direct marketing skills over the years, the editors of Target Marketing Magazine look to him to share his thought leadership of how to sell today. Analysis and diagnosis. As a proven fractional CMO, Hennerberg digs deeply into your data and interpret trends to discover where marketing turnaround and new product sales opportunity lies. Create your marketing test plan. He determines whether your marketing message belongs online or offline – he's media agnostic, driven to recommend only what makes sense for your bottom line. He puts the strategic marketing plan to action. Great ideas are easy to dream up. Putting ideas into action is tough, but his track record and marketing examples speak for themselves. Watch Hennerberg's marketing example videos where he shares how he used a purpose/frequency/free content strategy to turnaround marketing revenues by 20%. How he used data from a model to better understand the composition of customers and increase sales by 35%. Or how he identified a unique selling proposition and repositioned a product that increased sales by 60%. Read marketing consultant biographies and get better acquainted. And keep up with Hennerberg on his blog. Then contact us and set up a free 15-minute phone consultation.